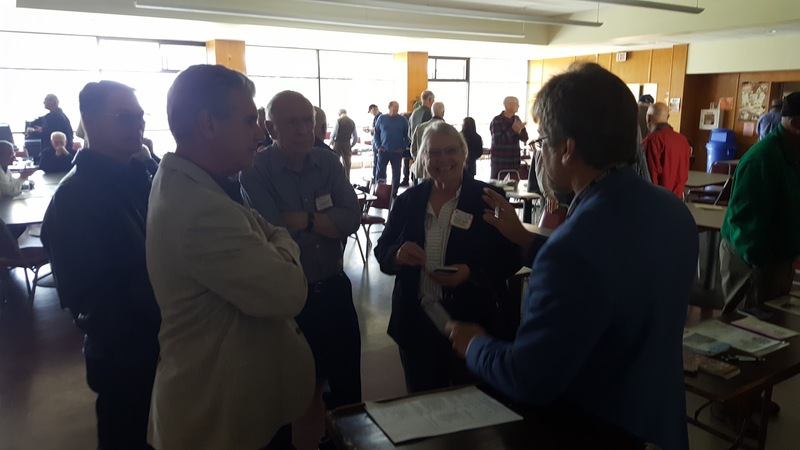 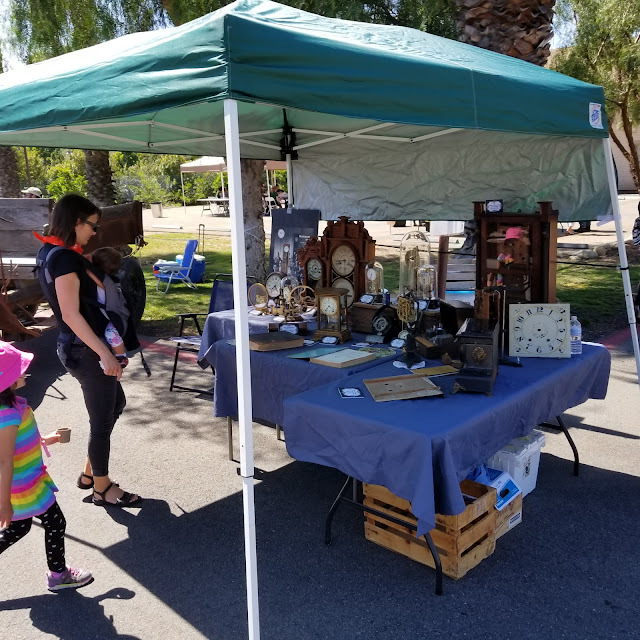 A gallery of photos from March to July 2018. We have had a lot going on. 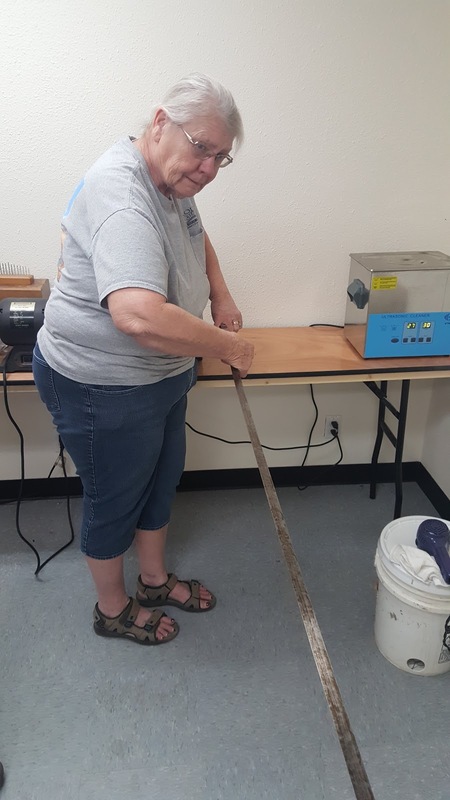 WCCWM Cleaning day in March 2018. 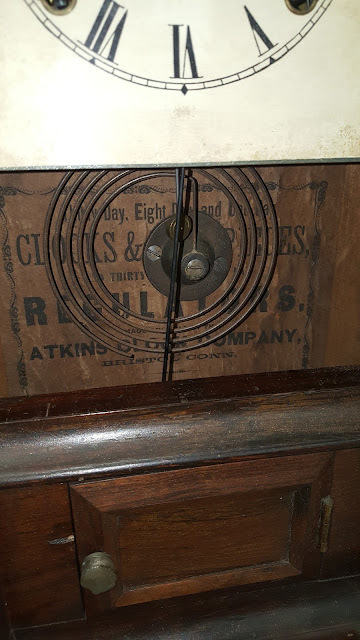 "I don't need no stink'n ladder!" 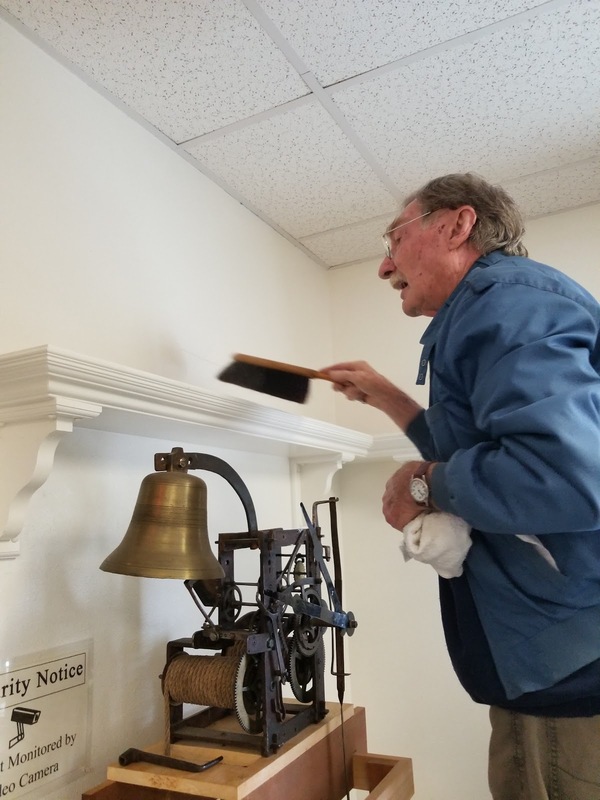 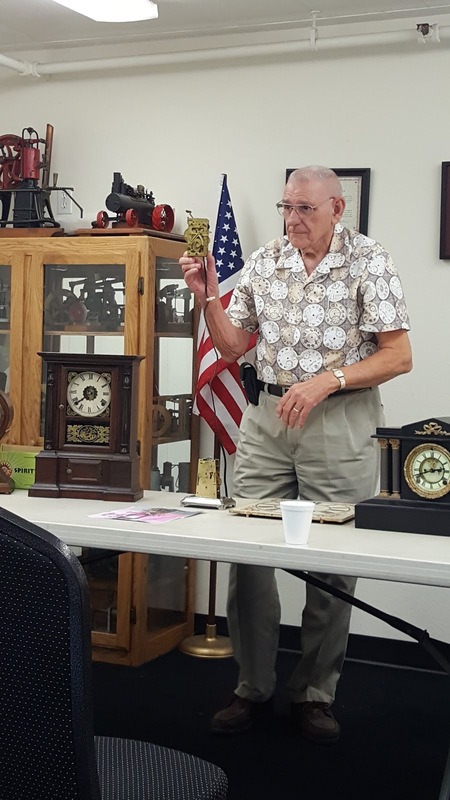 Chapter 136 March Meeting, Rod gives presentation on a 1850's Heidrik Langout 9 Bell Strike Longcase that he repaired. Andrea's March Meeting Show and Tell is a 1930's English Anvil Clock. 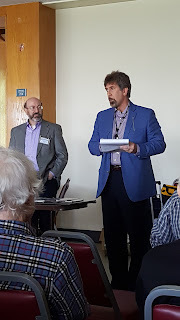 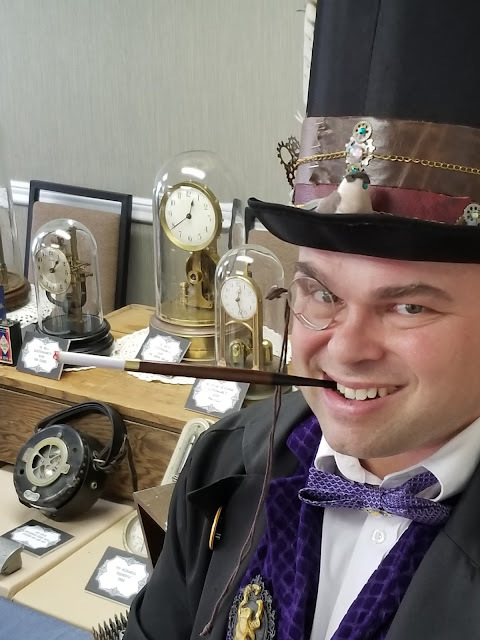 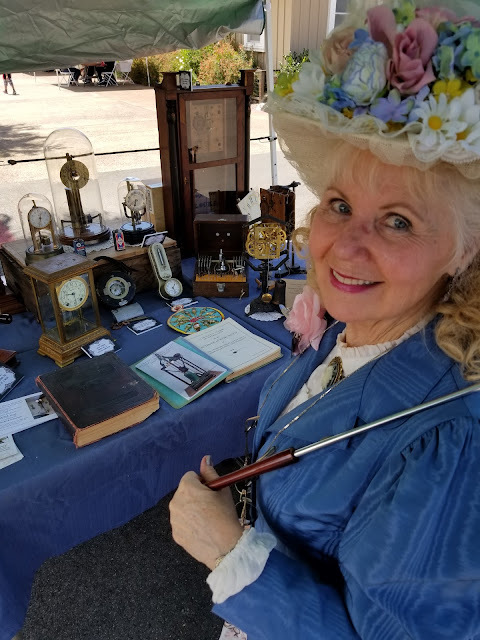 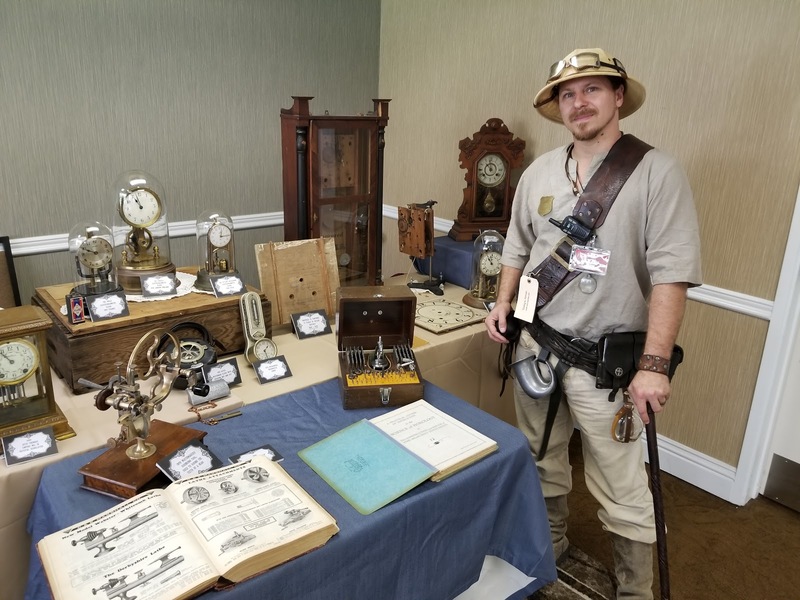 Dan represents NAWCC, West Coast Clock & Watch Museum and Chapter 136 at the 2 day Gaslight Gathering Steampunk Convention April 2018. 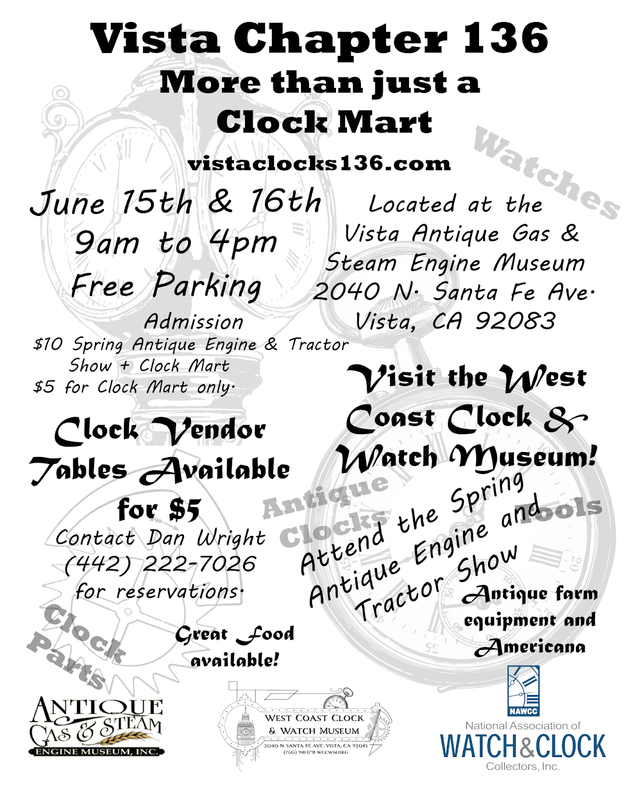 Dan joins the Steam Team from AGSEM at the Irvine Ranch History Park in April to represent the WCCWM, NAWCC and Chapter 136. At the April Meeting Andre's Program was on How to Make Suspension Springs. 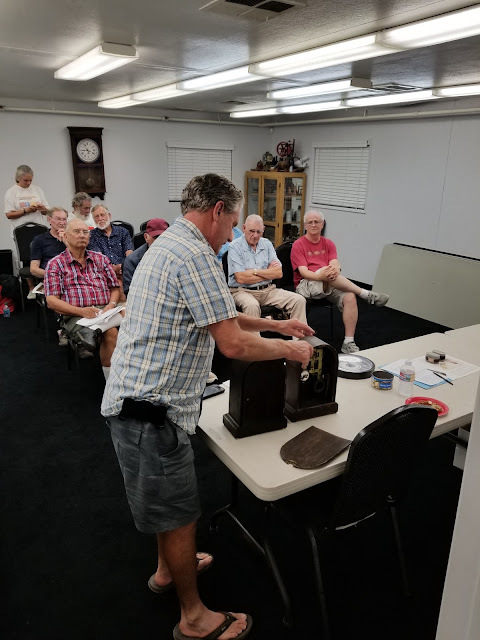 At the June Meeting Dan gave a program on Electromagnetic Clocks. 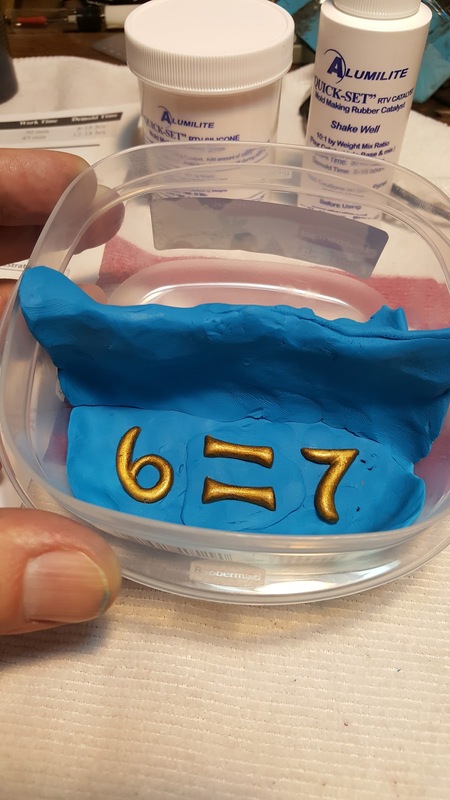 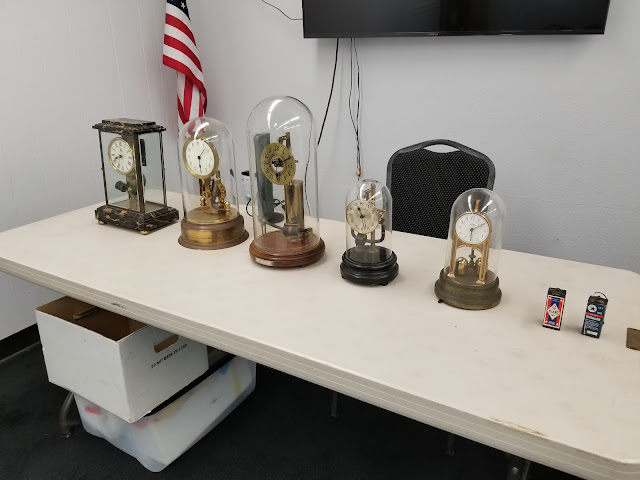 Show & Tell for June Meeting. 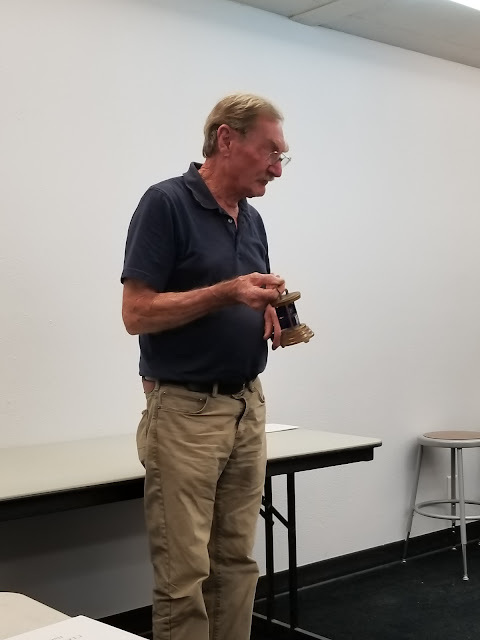 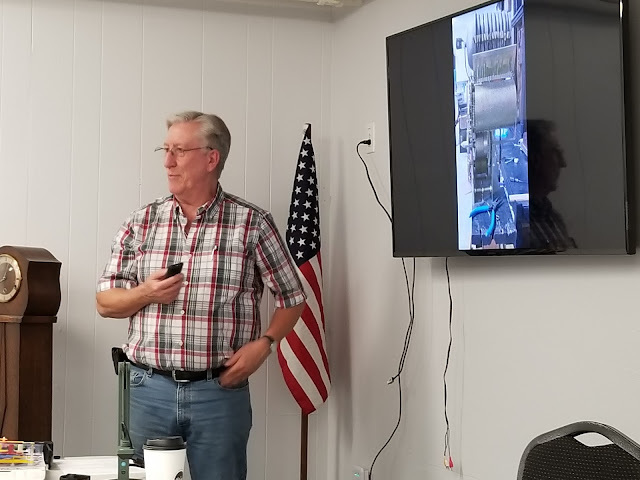 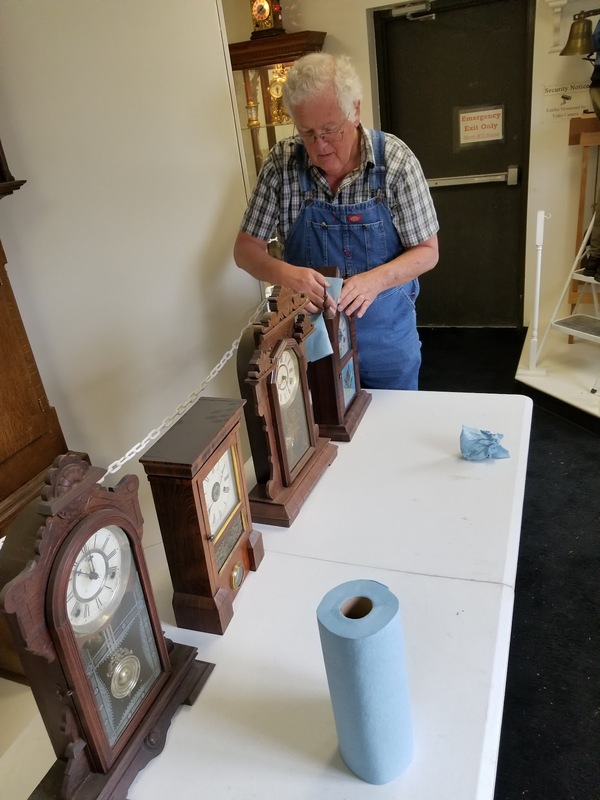 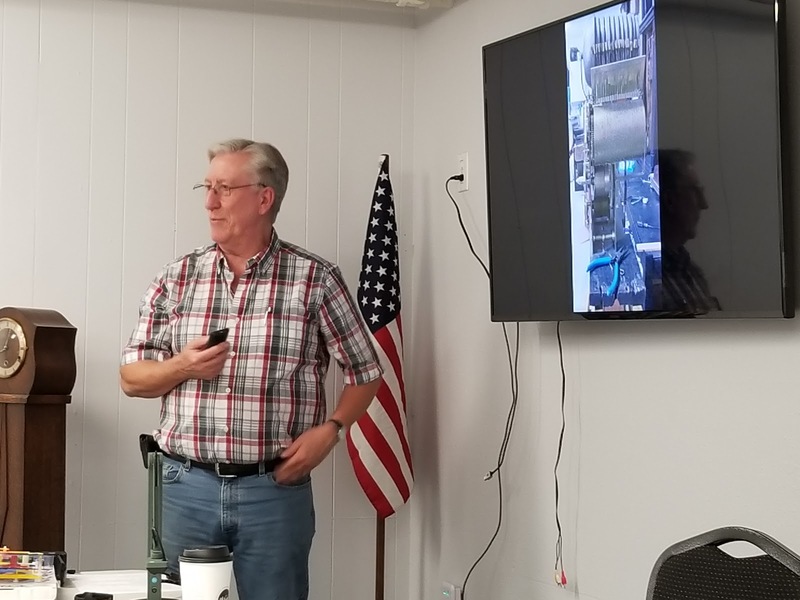 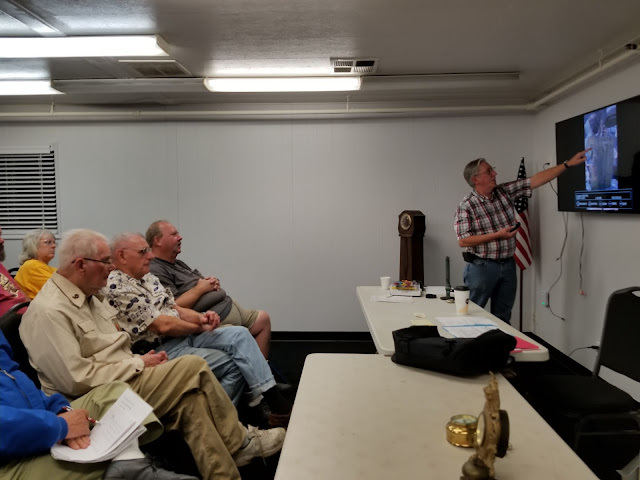 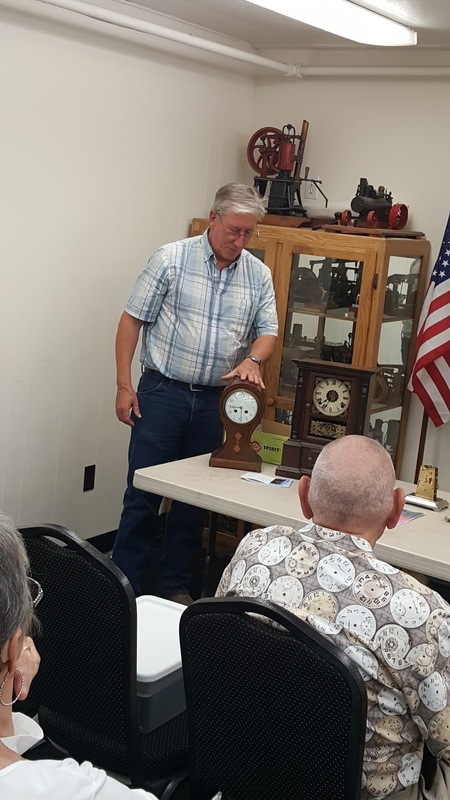 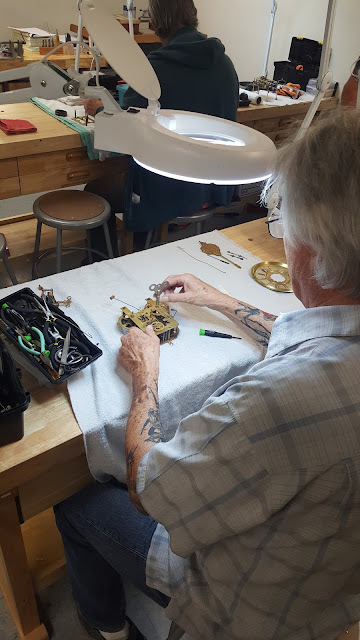 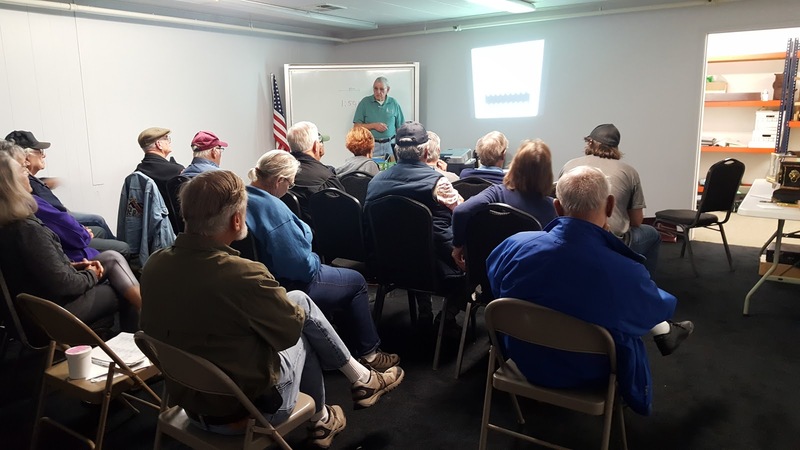 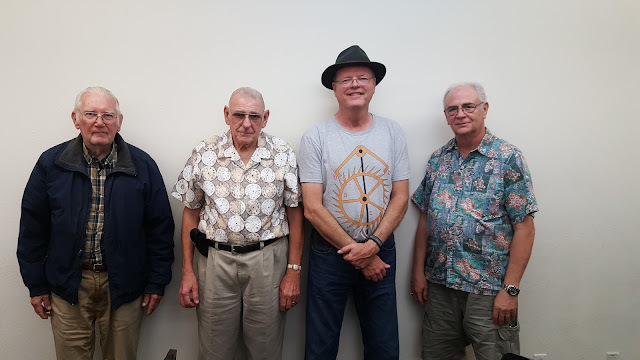 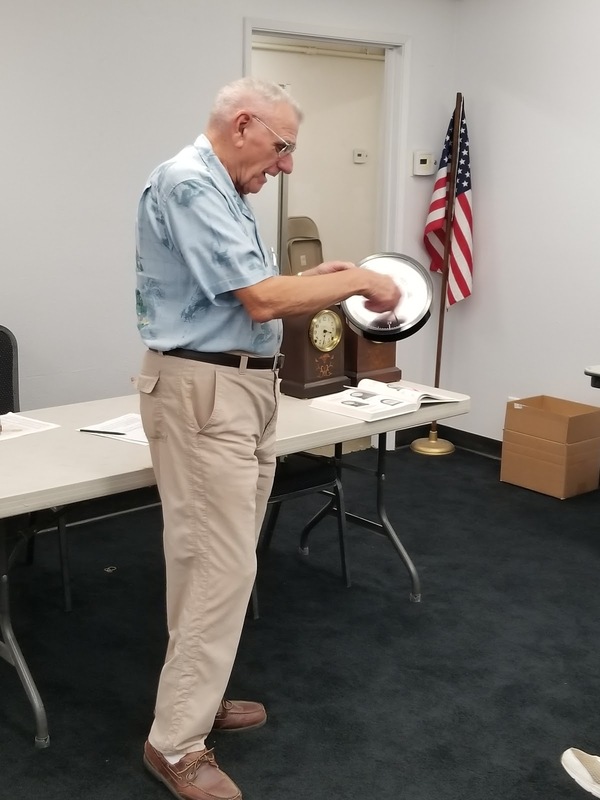 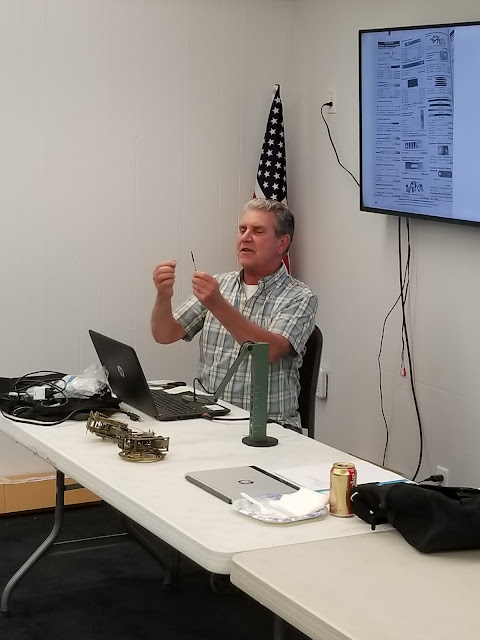 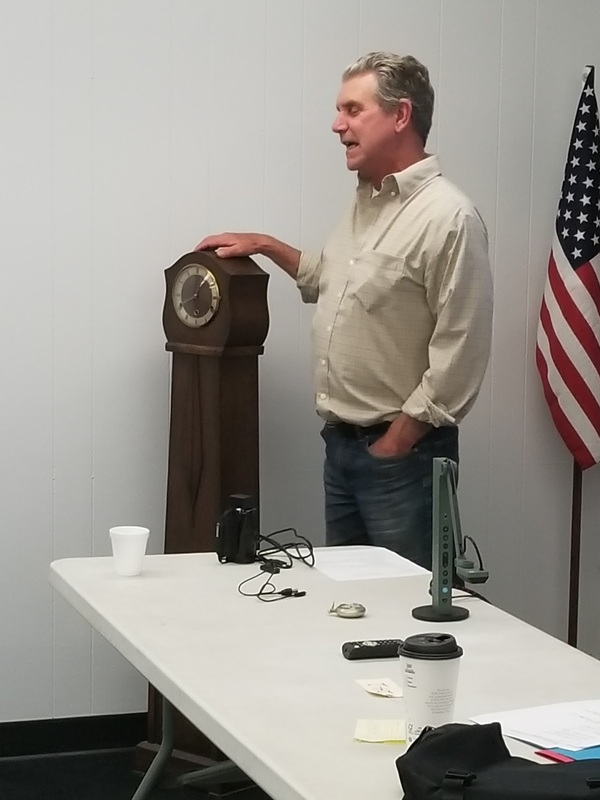 July Meeting, Rick gave a program on "The things you can do with a quartz movement" He is showing off a true "Banjo Clock"! 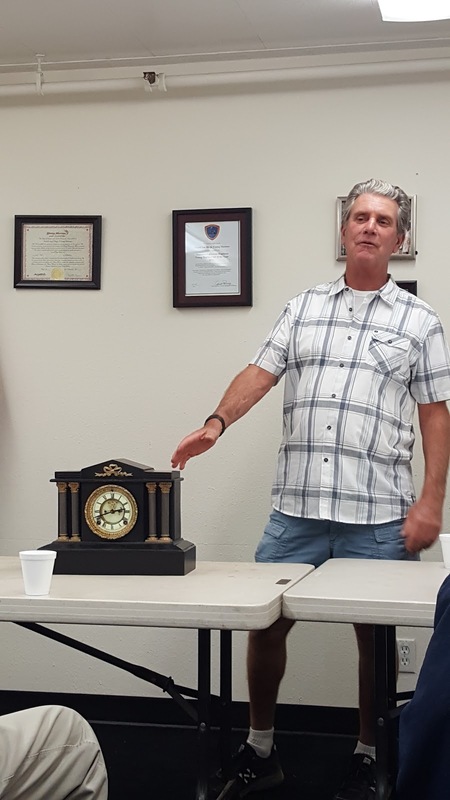 July Show & Tell, Bob's shows his quartz atomic clock. 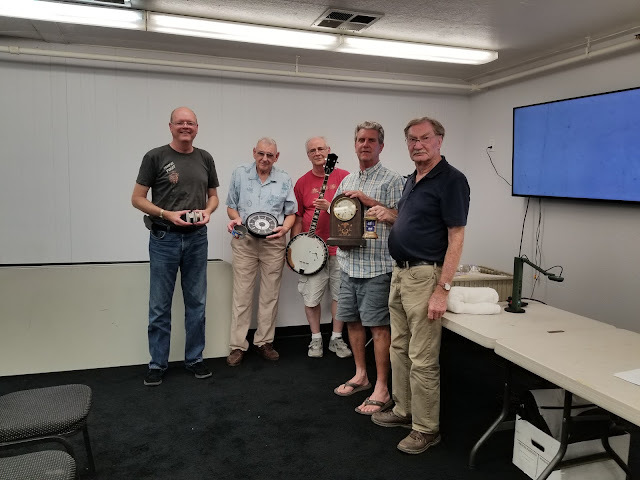 The Show & Tell Gang at the July meeting. 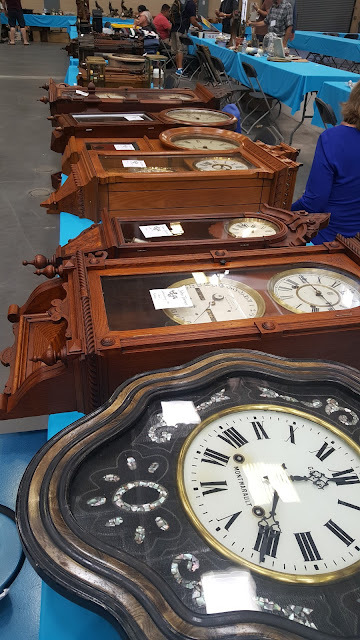 October is Clock Month for many of us. 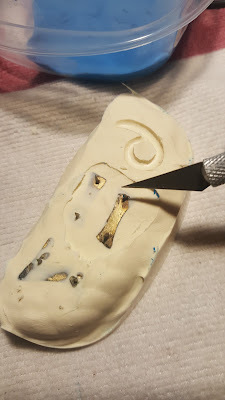 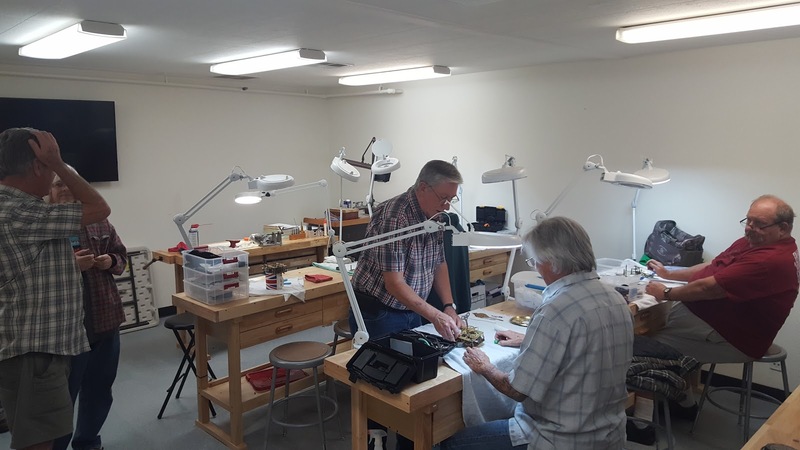 Almost every weekend this month provided us with an opportunity to get involved with our hobby. 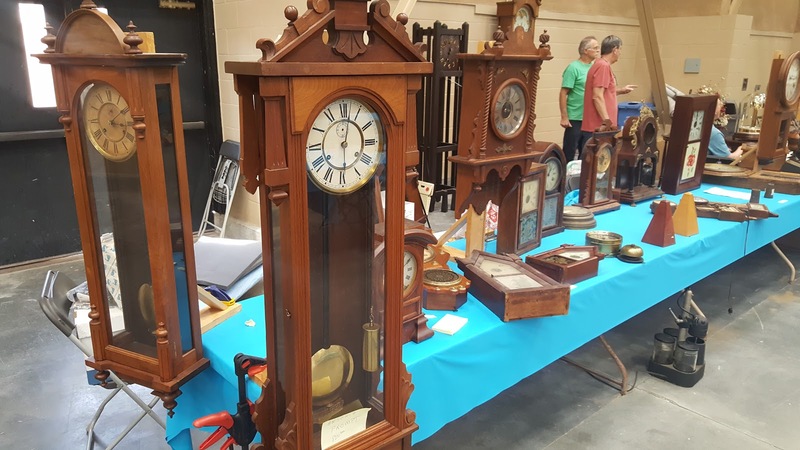 *Oct 7th and 8th we sponsored our Chapter 136 Clock Mart at AGSEM. 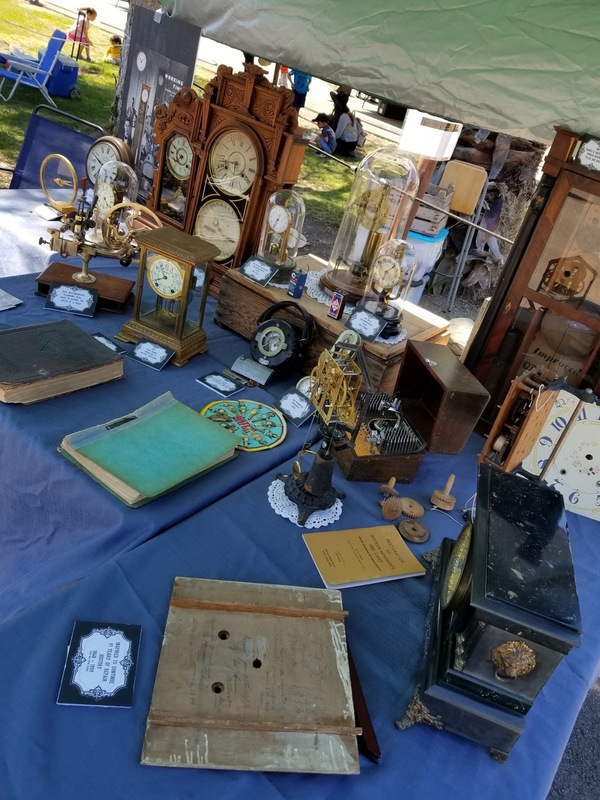 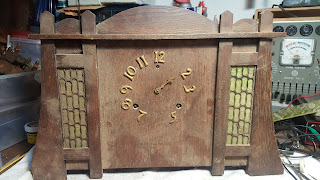 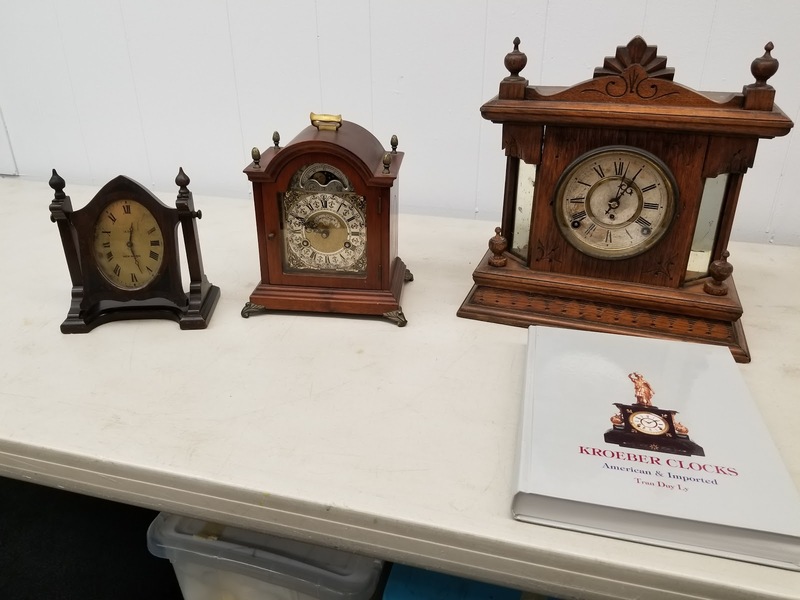 We filled the Farm House with tables full of clock goodies. 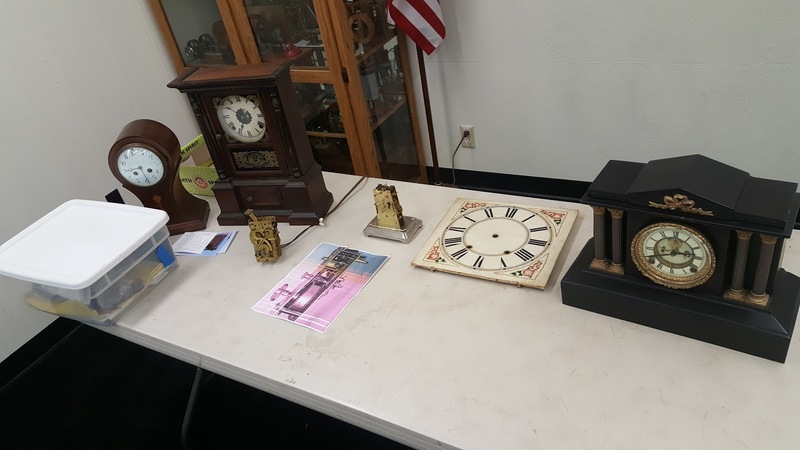 Because of the other events at the museum we got to introduce our club and horology to many who past by. 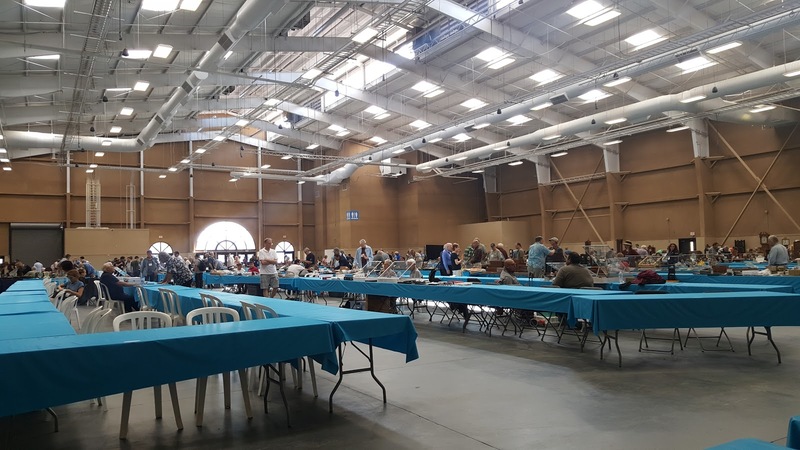 *Oct 14th & 15th sent us to the Del Mar Fair Grounds for the NAWCC Southwestern Regional many of our members assisted Chapter 59 with registration and setup. 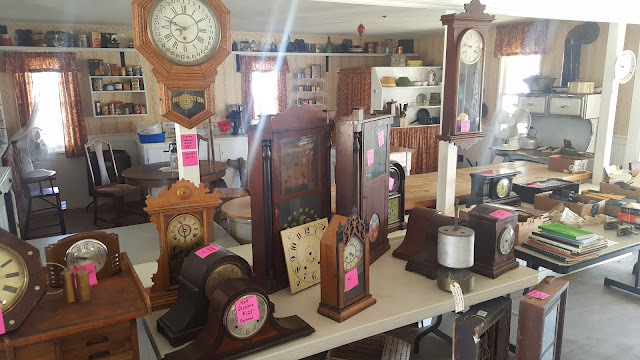 The deals were abundant and many treasures were found. 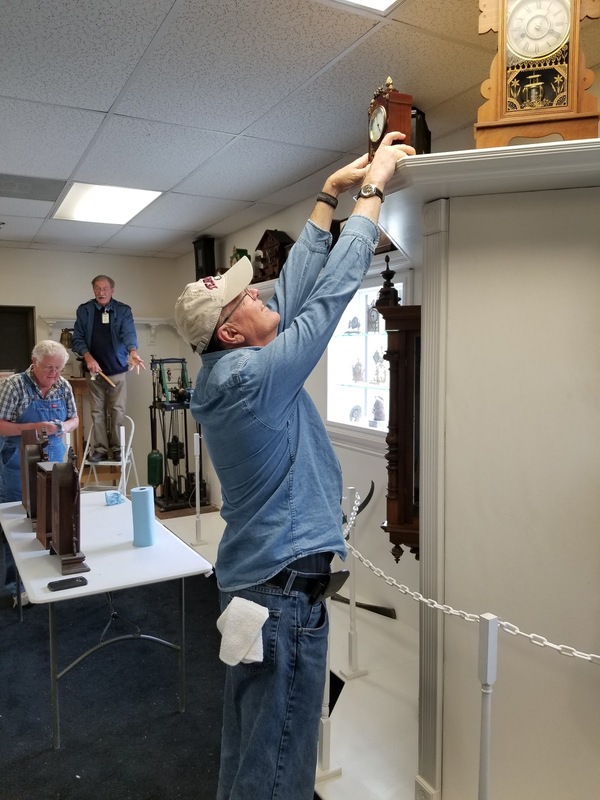 * Oct 21st,22nd,28th & 29th found many of us at the West Coast Clock and Watch Museum as Docents during the AGSEM Fall Show. 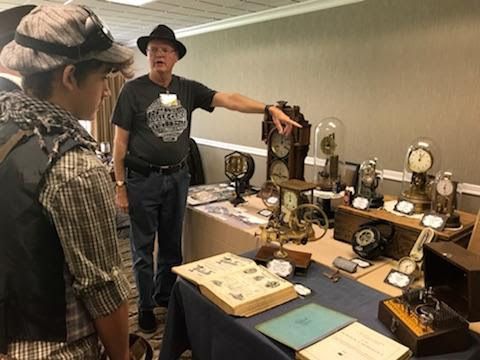 What a wonderful opportunity to introduce Horology to both young and old! For many it was the first time they had visited the museum or had seen so many clocks and watches in one place. * Oct the 28th was our monthly Chapter meeting. 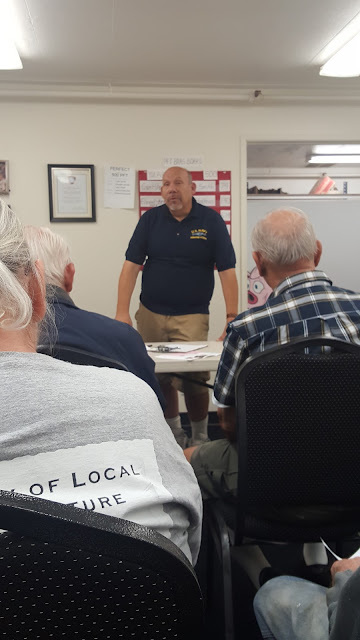 New officers were elected, Ernie Lopez gave a presentation on the history of the WCCWM, Lots of show'n tells were presented. See the photos below for highlights of our busy month. 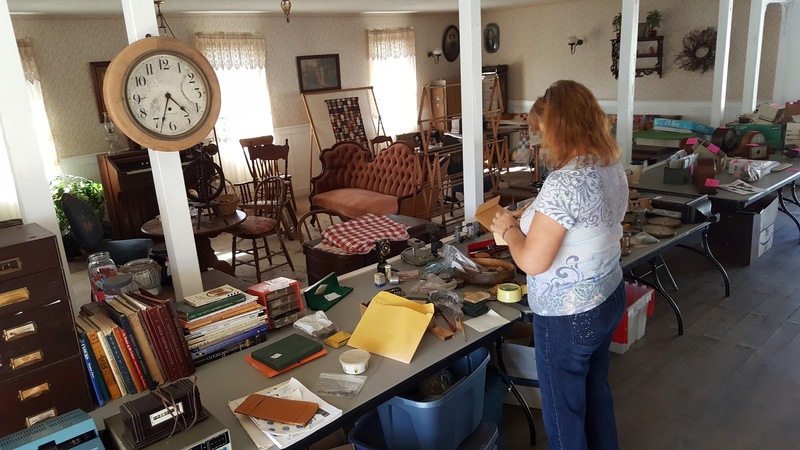 There will be no meetings until January 2018 due to the Holidays. 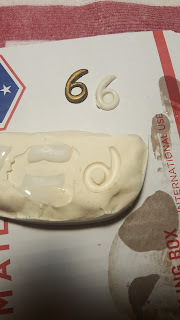 Have a great rest of the year. 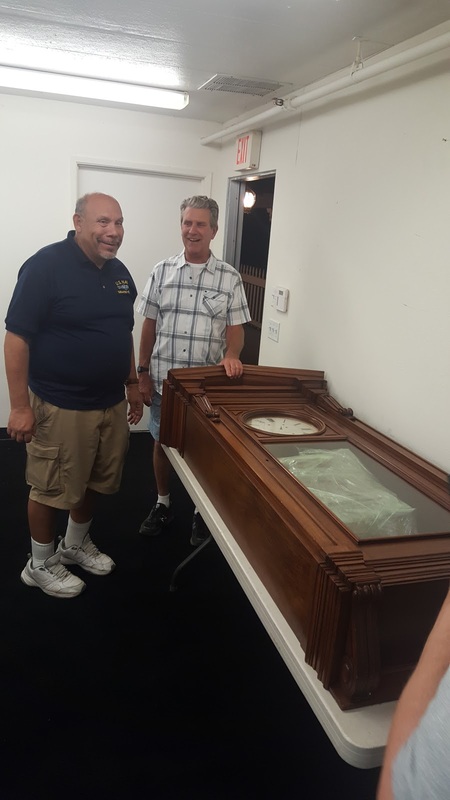 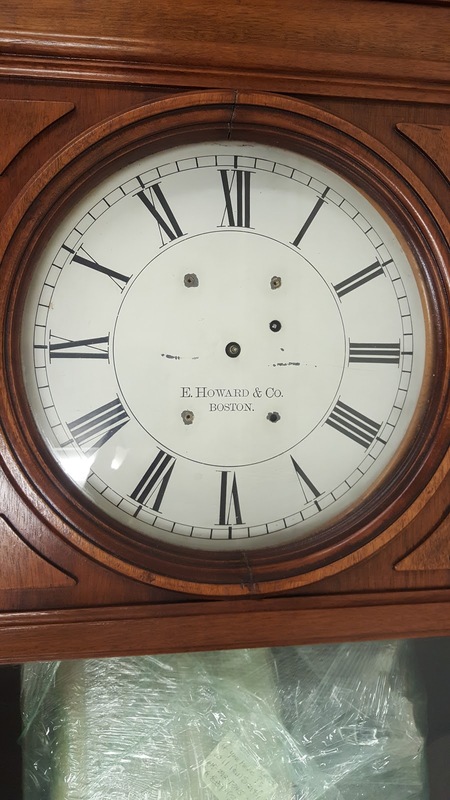 Ernie and Andre sizing up the E. Howard that was recently acquired for the West Coast Clock & Watch Museum. Show'n Tell time at our October meeting. 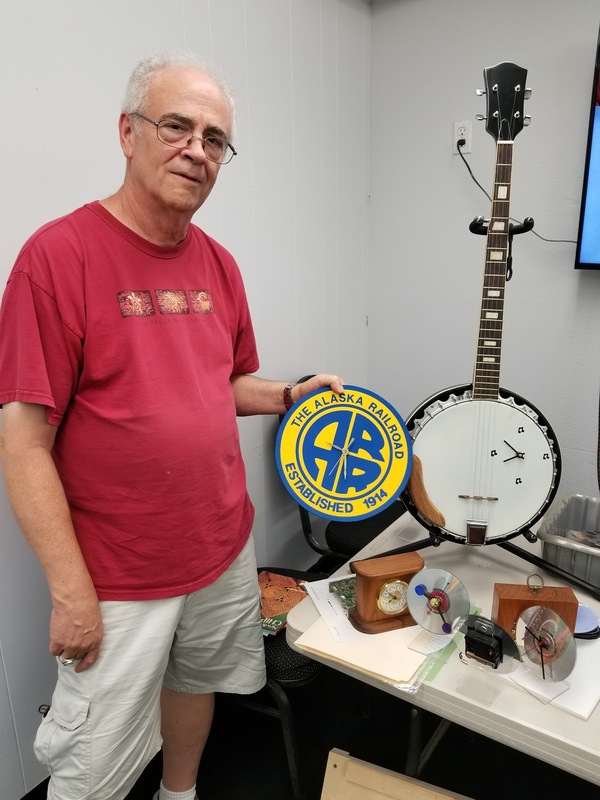 Rod shows us the treasures he found. 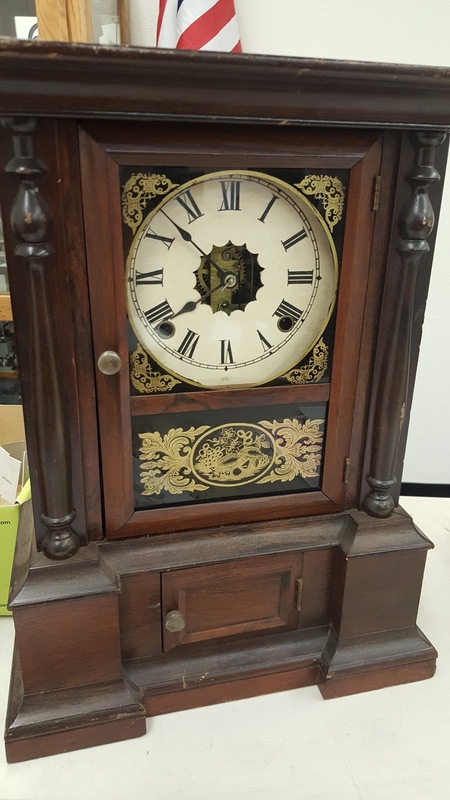 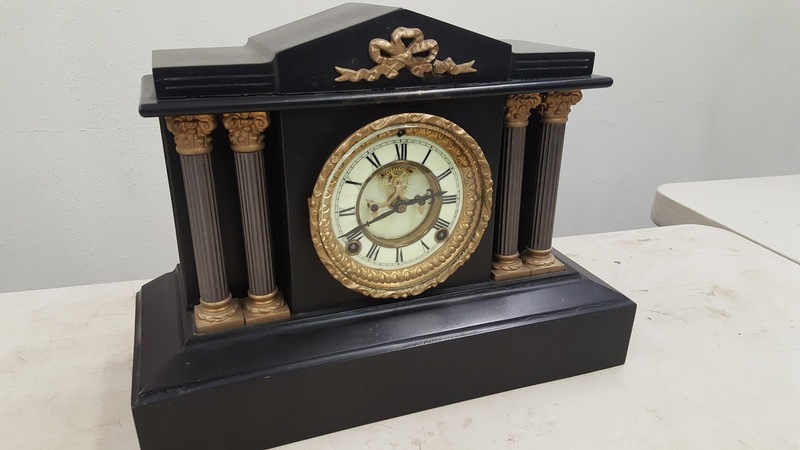 Including a rare Atkins mantle clock. 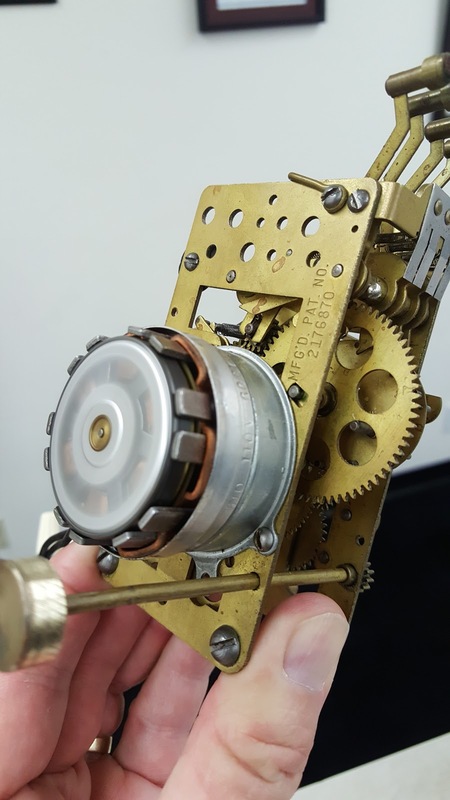 Bob's very early electric clock movement.